Happy April Fools Day! 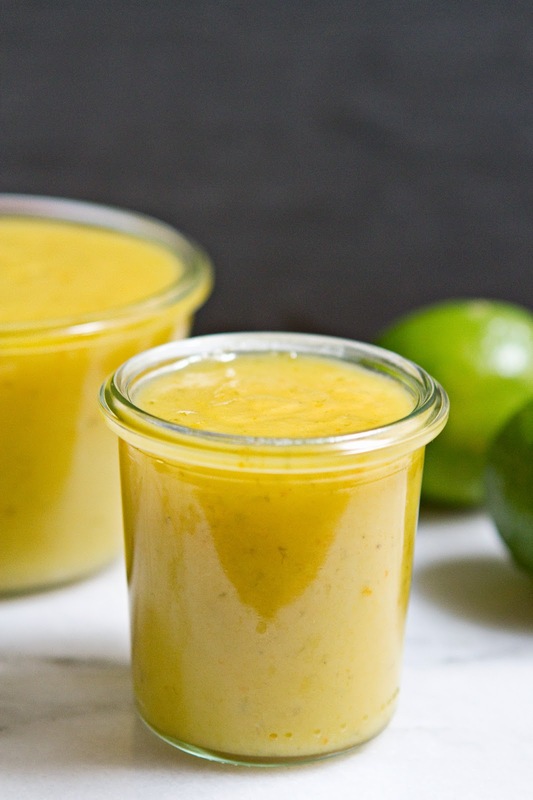 I don't have any clever tricks or pranks to play on you, just truly delicious tangy and sweet tangerine lime curd to share. 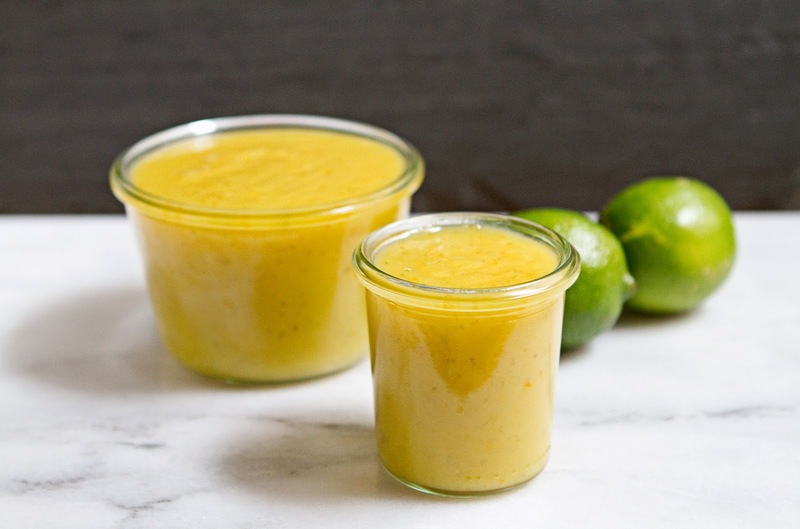 There is something really phenomenal about this curd, it's lusciously thick and smooth, tangy, almost-sour from the lime, sweet and tart from the tangerine with a creamy, custardy undertone. 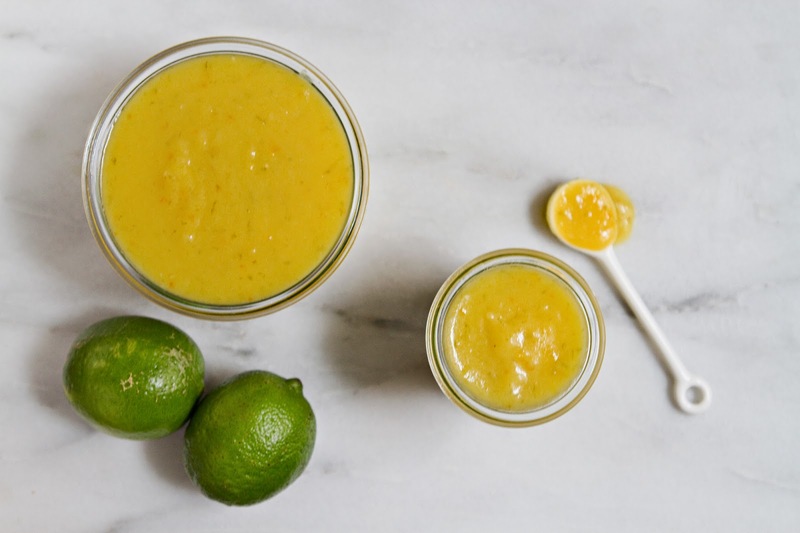 A few weeks ago I was making a batch of lemon curd for a shortbread-lemon tart, when I got to thinking that I'd never tried to make curd from any other citrus, but there was certainly no reason not to. I thought of all the possibilities: blood orange, grapefruit, key lime! And then I went to the grocery store down the block. I live in Chinatown, so my local grocery store is a slightly different experience from a typical big box grocery store shopping trip. The shop occupies the basement and first floor of a moderately tall building that nestles right up next to the Manhattan bridge. It's new- prior to this we shopped at a grocery store that was literally under the bridge, and partially outdoors, so this is like our luxury grocery store. The first floor is mainly dry goods- powdered, dried, bagged, and loose teas, candies, cakes, rice flour, bottles of oyster sauce, fish sauce. Canned lotus root, next to canned minced pork, next to canned rainbow agar jelly, and an aisle with every type of noodle from ho fun and chow mein to mung bean, to japanese soba and somen. There is also a snack aisle that S tries to get me to avoid because my eyes get all big and I start loading everything into the basket- maple cakes! taro wafer cookies! lychee jellies! black sesame everything! Down in the basement are all the perishables. In the back there is a sparse dairy selection flanked by freezers full of a vast array of bao (buns)- pork, shrimp, vegetable, fish, red bean, black bean, melon, peanut, black sesame (my favorite! ), taro, pineapple, custard, coconut, even some durian! In the front of the store you'll find the meat and seafood. In the meat section there's a wide selection of whole chickens- head on, head off, pre smoked, black skinned, or perhaps you prefer duck? Smoked or raw duck? The seafood side includes massive bins (lets call them what they are- they're rubbermade trash cans), full of live frogs and turtles. There's also a dazzling array of fish types. Right in the middle, in between the smoked tofu (so so delicious! ), self-serve frozen fishball bar, and barrel of live eels, is the produce. The produce section is a bit of a wonderland itself. On any given day there's likely to be jackfruit, long beans, giant strawberries, young thai coconuts, taro root, delightful little apples, luffa gourd (my shop spells it loofah though! ), deep red blood oranges, super juicy plums, or a completely different set of delights. 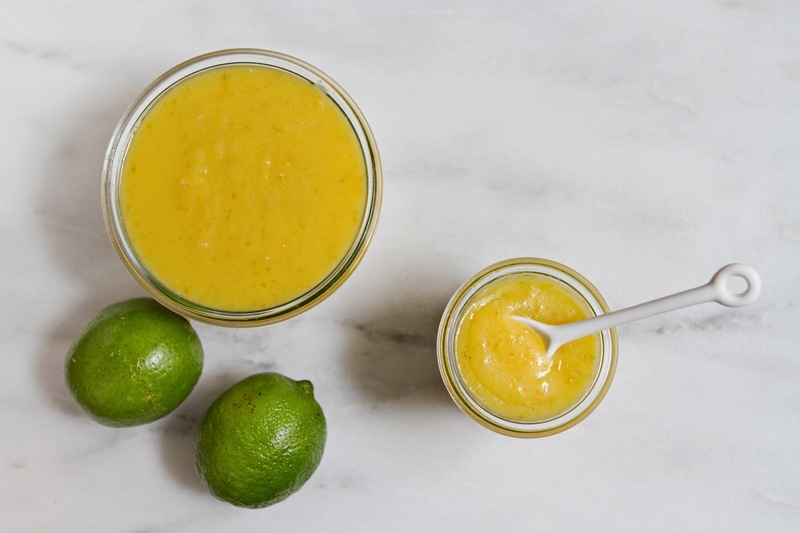 There's very little consistency with the produce selection, so I went to the store with an open mind about what type of citrus curd I'd make. What I found were rich, vibrantly orange juicy tangerines. There were lovely grapefruits, and even a bin of calamansi fruits, but the tangerines were too bright and beautiful to refuse. I grabbed some limes to add a streak of tartness because I always love a little zing of lime alongside sweet citrus, and I headed home, after stopping upstairs for some black sesame wafer cookies to snack on. The resulting curd is lovely. I put it on everything for the next week- toast in the morning, apple slices for a quick snack, I used it to make creamy citrus-vanilla milk shakes for dessert, spooned it into greek yogurt, served it over strawberries topped with whipped cream, and my favorite use, I blended it into a frozen strawberry & coconut milk smoothie for incredible results. 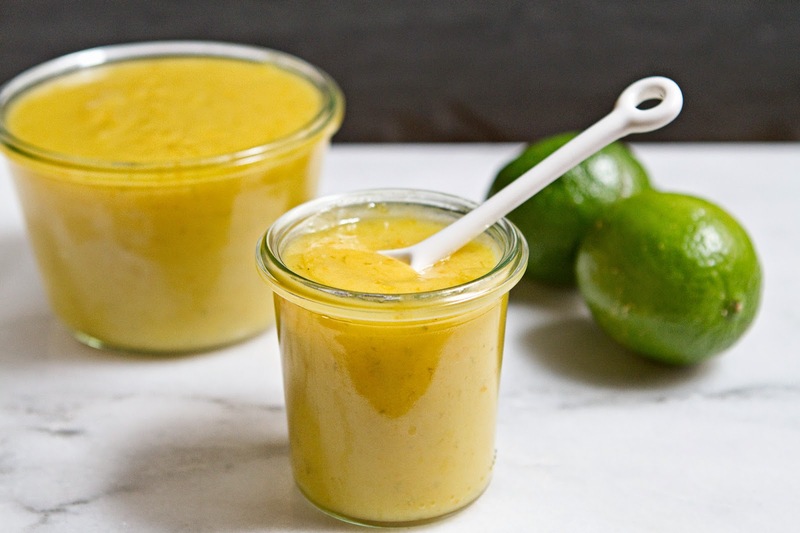 If you can think of any other delicious uses for this sweet and tart Tagerine Lime Curd, let me know in the comments! Enjoy! Zest the two limes and one of the tangerines, then juice both tangerines and 1 lime to get about 1/2 C juice (if you have extra, drink it, it's delicious!). Set juice aside. 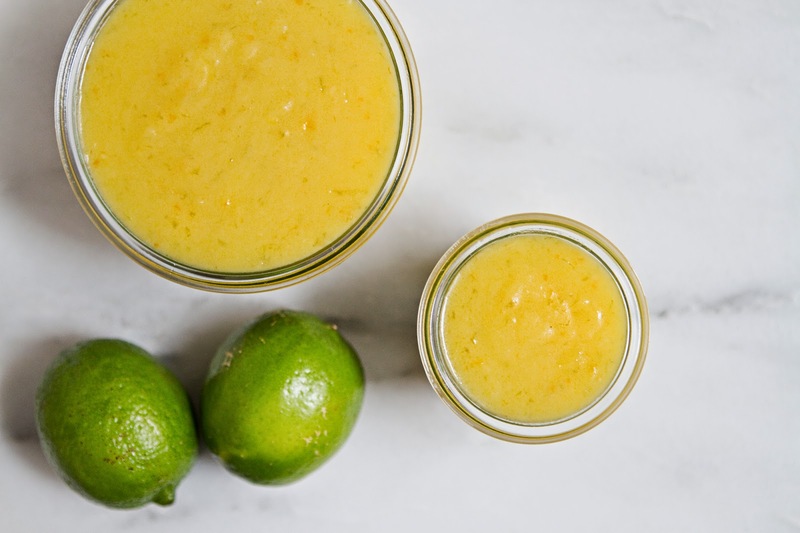 Combine the zest and the sugar in the bowl of a food processor. Pulse until zest is broken down into sugar. Remove sugar from food processor and add to a bowl with the butter. Cream the butter and sugar until smooth. Beat in the eggs one at a time, then add the tangerine/lime juice and beat again until well combined. Pour into a saucepan and heat over low heat, stirring constantly, until curd thickens. About 10-15 minutes. 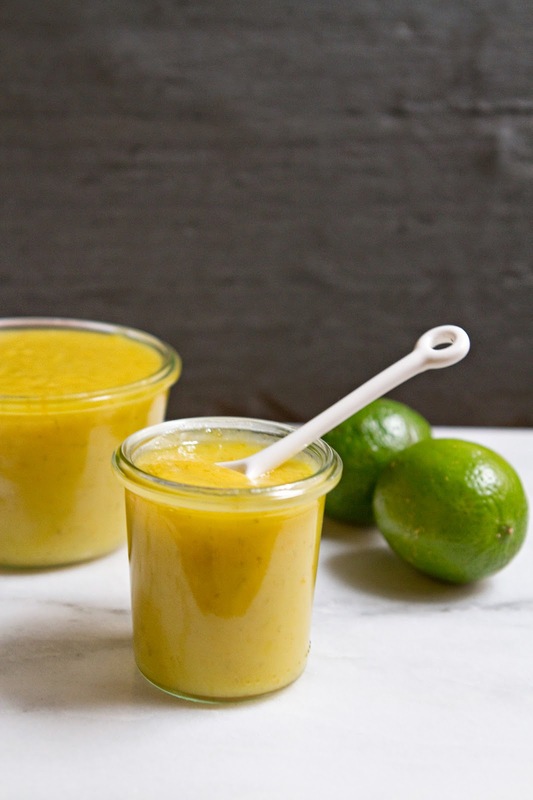 If the lemon curd begins to bubble turn the heat down a smidge, you want to keep it just under simmering temperature. If you'd like to use a candy thermometer, the curd will thicken at 170F, remember to keep the thermometer from touching the bottom of the pan. It should get thick enough to coat the back of a spoon, and then just a bit thicker. Once thickened, remove the curd from heat and pour into jars. I ended up with about 20 oz of curd. Once curd cools to room temperature, keep it in the fridge. It'll thicken a bit more once cool. Try this curd over vanilla ice cream, on poundcake, toast, or as an apple dip! It's heavenly blended into a strawberry smoothie too. 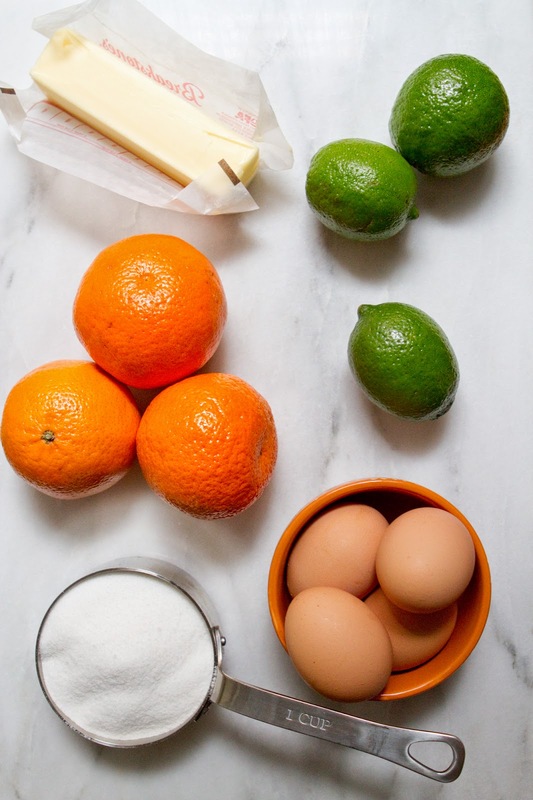 Alternatively, you can pour the curd into a pre-baked pie crust (a graham cracker or shortbread crust works well) and refrigerate it for a few hours to make a lime-tangerine tart. These pictures are to drool for. Although its only curd but its looks so tempting an delicious. I will try it, it can surely go for a light refreshment in a party.